Qatar has made little progress on improving migrant workers' rights, despite promises to do so, the rights group Amnesty International has said. Amnesty has been monitoring conditions in the run up to the 2022 World Cup but says progress has been limited in some areas and non-existent in others. Qatar has disputed the Amnesty findings and says improvements have been made. "Significant changes have been made over the last year to improve the rights and conditions of expatriate workers," a statement by the Ministry of Labour and Social Affairs said. New accommodation for more than 250,000 workers is being built across Qatar to the highest standards, the ministry says. Furthermore it says that the majority of workers who come to Qatar earn "considerably more" than they would at home. The Amnesty report comes as two sponsors of the football tournament, Visa and Coca-Cola, voiced concerns over migrants workers' rights. An estimated 1.5 million migrants work in Qatar, many on the construction boom fuelled by Qatar's successful bid to host the World Cup. In its report, Amnesty says a promise from Qatar last year to change the system under which workers have to seek permission from their employers to leave the country or change jobs has not been met. It says the one change to labour laws that has been brought in, a wage protection system to ensure workers are properly paid, is being implemented slowly. One migrant told Amnesty he had not been paid since arriving in Qatar five months ago. 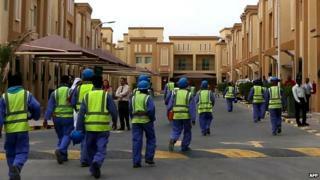 "Qatar is failing migrant workers," said Mustafa Qadri, Amnesty's Gulf migrant rights researcher. "Without prompt action, the pledges Qatar made last year are at serious risk of being dismissed as a mere public relations stunt to ensure the Gulf state can cling on to the 2022 World Cup." The report said football's governing body Fifa had a "clear responsibility" to put pressure on Qatar to do more. The ministry says that "the unique challenges brought about by rapid economic growth and the high population of expatriate workers seeking better opportunities" has led to Qatar becoming a regional leader in improving standards for migrant workers. "No-one should be in any doubt that we are committed to effective and sustainable change," the ministry's statement said.